We loved the property. Enjoyed sitting on the deck watching the sunrise, the tram going up and down the mountain; we even saw the paragliders coming off the mountain!!! Beds were comfortable. Cabin was very clean!! We had such a beautiful home and such a wonderful vacation, there isn't anything more we needed. The kitchen was stocked to the hilt and everything was new and beautiful. A true vacation when I feel spoiled in the space!! If I could suggest one addition: If Matthew McConaughy could have been waiting for me in the rental! Ha ha, nothing more we could have asked for..... we had such a beautiful home and such a wonderful vacation, there isn't anything more we needed. #40 - Beautiful home and at the end of the lane so very quiet. The home was so clean and comfortable. Checking in and out was a breeze. Overall neat log home. Not great for our young kids. Chief Joseph "Lodge" through us for a loop as we thought we were staying at the lake lodge at the south end of the lake. The team is the best I have worked with for providing information and assistance to make our experience wonderful. We had a great stay in Cabin 19, can't wait to do it again! We enjoyed our stay and being walking distance to everything put the lake was wonderful. Everyone was very helpful and pleasant to work with. We love the Trout View! We have been staying there every year for about 8 years now. It is our family's happy place. Though we had no need to speak personally with personnel, the on-line communication was excellent. All instructions and expectations were well explained. The bunkhouse is a PERFECT place for two! The location was very quiet - sharing a yard with the main house and two fences with a RV park was not an issue. All of the housewares were in excellent condition. The quantity and diversity would meet any chef's needs. The basic spices, pan spray/oil, baggies, foil, etc on hand were well thought out. The bed was comfortable. We were impressed also with the overall cleanliness. The private patio is a nice amenity. There is nothing more spectacular than morning coffee outside with sounds of the river and deer visits. Everyone we talked to was helpful and knowledgeable. We arrived a little early and the young girl cleaning the unit was friendly and did an excellent job of cleaning the unit. i asked to use the bathroom, the kid said that the company had a policy of not allowing anyone in while she was there, a policy i fully understand, You and your company cannot be too careful in today world. A few minutes later her supervisor can by and we worked things out. I liked emailing the lady who was local. She was very kind and efficient, and when I spoke to her on the phone, she was very polite. However, I did not care for the after hours answering service, that couldn't tell me anything about the reservation, but just said they'd relay a message. My husband called to ask for an extra day and they never called him back, so I called the next day and the local lady called me back right away. I loved the treehouse effect of having the living/dining area upstairs. The rockers on the front porch are perfect for morning coffee. The kingsize bed, very comfortable, and the decor, just right for a mountain retreat! Very nice. very nice people. meet all of our expectations. excellent! loved the location, logs, bbq, view, deck, lots of parking, peaceful, boat dock. Everyone was friendly, efficient, and helpful. We loved our stay! The place had everything we needed and is an ideal location. The patio suite is small, but the outdoor area was like an additional living room, and you cant beat the price. We very much appreciated the fact that our dog could come with us. Team was friendly, helpful, and patient! Great location! Comfortable and welcoming, sound of the river wrapped us in peace as we read, journaled, and rested! We called to check in about an early check in and the staff was super friendly and was able to accommodate our needs. We stayed for a week this trip. This house is a great place to come back and rest after spending days at the lake or up on the tram. 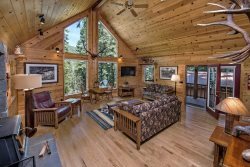 It is close to several amenities in town, but still has a cabin feel that creates relaxation. We will be back again!